Meet your new feathery best friend, the Virtual Pet Owl! Feed, pet, and tell jokes with your owl to keep him happy and healthy! Download the Virtual Pet Owl today while it's FREE for a very limited time! + ADORABLE 3D OWL - It's up to you to care for your very own owl! + DOZENS OF ACTIVITIES - Keep your owl happy and hooting with fun activities like dancing, petting, and telling jokes! 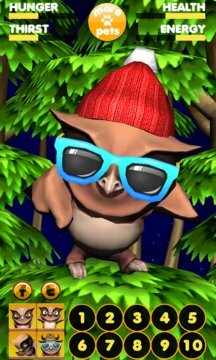 + SILLY ACCESSORIES - Give your owl some style with sunglasses and a hat! 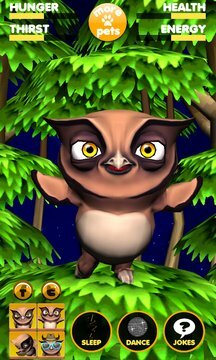 + BEAUTIFUL ENVIRONMENT - Behold your owl's gorgeous 3D home in the trees! + HD GRAPHICS - Gorgeous High Definition graphics look so real you'll fall in love with your new pet at first sight! Download Virtual Pet Owl and start having fun with your new best friend! It's a real hooot! Be sure to check out our other adorable Virtual Pets too! Snuggle up with the cuddly Virtual Pet Kitty Cat or soar through the skies with the Virtual Pet Eagle!